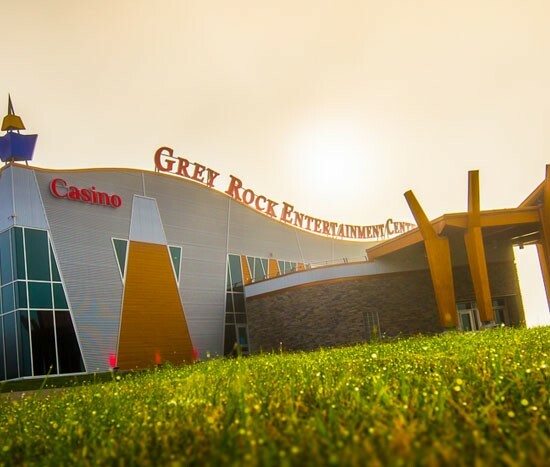 Located right at the entrance of Edmundston NB, Grey Rock Casino is a modern, state of the art Casino, Bingo and Dining experience! Offering over 200 slot machines, two electronic table games, blackjack and roulette, and live poker tables Thursday to Sunday. A spacious Bingo Hall with room to seat over 400 bingo players and Electronic handheld Bingo devices that let you play more than 30 cards along with your traditional paper cards…all at the same time. The Fiddlehead Café is open from 11AM to 10PM Monday to Saturday and 10AM to 10PM on Sundays, offers a solid menu of favourites like burgers, poutine, wings, nachos and more. Lunch specials are offered Monday to Friday from 11AM to 2:30PM at only $7.99 for Totem Reward Club Members and $9.49 for non members. You also have to try our steaks at the Valley View Restaurant, located on the 2nd floor of the casino! Open 7 days a week from 2PM to 10PM.